Unfortunately, every rider must pay the price for the reckless few. Insurance policies for motorcycle riders in the state of California can be steep. That makes shopping for a good policy essential, because you do need that coverage. On top of the expense, insurance companies are likely to blame you, the motorcyclist, for most accidents. Sometimes having insurance is not enough. If you’ve been injured in a motorcycle accident, you may need a tough lawyer to make sure you get proper compensation. Do You Have to Have Motorcycle Insurance in California? There are many motorized vehicles out there. First question: what qualifies as a motorcycle? According to the California Department of Motor Vehicles, two-wheel vehicles that fit within the definition of a motorcycle include: motor-driven cycles, mopeds, motorized bicycles, minibikes, tote-goats, and motorized trail bikes. Before they can operate on a state highway, they must meet all applicable requirements for registration and insurance. Yes, you need liability insurance. $15,000 for injury or death to a single person, when you caused the accident. $30,000 for total injury of death of multiple people, when you caused the accident. $5,000 for property damage, when you caused the accident. State law requires all motorcycle operators and passengers to wear approved safety helmets at all times. This is true no matter what type of bike you have. Not wearing a helmet could not only garner you a citation, but would likely violate your insurance terms in the event of an accident. It is also necessary to have your insurance documentation with you at all times while operating your bike. First of all, be sure to examine all your options when looking for a policy. You may be tempted to assume that all companies are the same. They’re not. Second, it can be enticing to just purchase the minimum amount of insurance. Don’t. This is rarely enough if you get into a serious accident, and could leave you exposed to a lawsuit. It’s also important to realize that liability insurance does NOT cover your own injuries or damage to your own bike. You’ll need additional coverage to protect yourself. Collision: This type of policy covers damage to your motorcycle, minus any deductible. Comprehensive: This coverage protects you if your motorcycle is stolen or suffers damage from something other than a collision with another vehicle, such as hail damage or hitting a deer. Personal injury protection: This coverage is more inclusive than medical payments, and covers medical expenses for the operator, any passengers, and any pedestrians who are injured in an accident, regardless of whose fault it was. Trip interruption coverage: This policy covers lodging, transportation, and food if your bike is damaged in an accident more than 100 miles from your home. 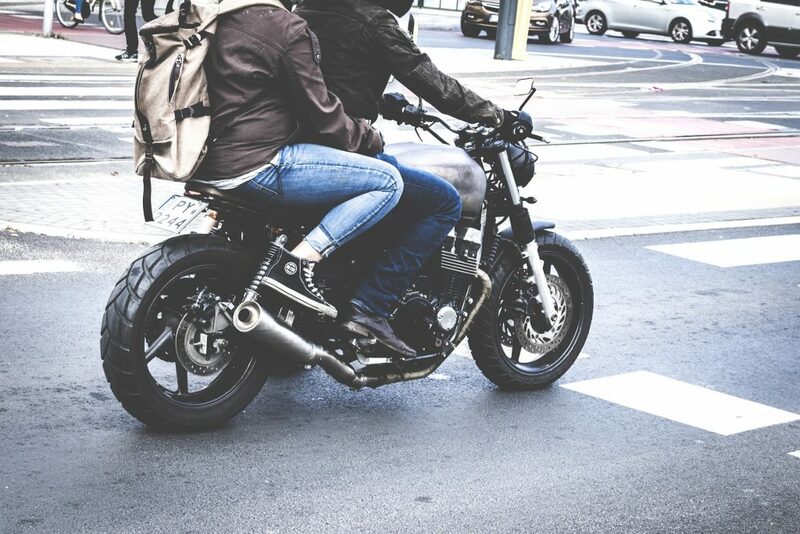 Coverage for custom parts, equipment, and accessories: This adds additional coverage to comprehensive and collision policies and is designed for bikers who have invested a lot of money customizing their vehicles. Transport trailer coverage: This applies to damage to a motorcycle trailer caused in an accident. Roadside assistance: Covers towing and labor charges in the event of a breakdown. What Happens If You Have a Motorcycle Accident? Because of bikers’ so-called “bad reputation,” after an accident, you may find that your insurance company is actually actively working against you in order to limit its payout. If you’ve been injured in an accident, we recommend that you consult with us at Jurewitz Law Group. We know insurance companies like to play the “motorcycle drivers are inherent risk-takers” card to make it seem like you were at fault for the accident. We understand all the insurance companies’ tactics, and they piss us off when they try to undervalue valid claims. Don’t try and face insurance companies alone. Call our San Diego motorcycle accident attorneys. We’ll sit down with you and listen to what happened. If we can help you tackle the at-fault driver and insurance company for fair compensation, we will, for no upfront charge. Call (888) 233-5020 for a free consultation today.